I have an existing project that has been running reliably when started from the IDE. I have port 9080 (I believe the default?) specified in Preferences. Today I created a new project (with Beta 3) and apparently it wants to run on a strange port? The URL I see has 9081 as port, even though I haven't set that anywhere. Consequently my app won't run. What might I be missing? Hmm - I can't see any port field in Compiler Options; I see only the one in Preferences -> Compiler and that one is set to 9080. But since you wrote 'also' you are implying that there are at least two port fields. Could you be more specific as to where the 2nd one is? I did not modify the default port in Preferences, so it is set to 9080. Where does the 9081 port come from? I checked and it's not in the SBP file. 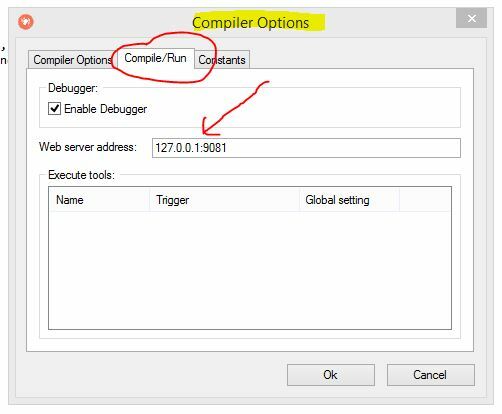 kpeters58 wrote: Hmm - I can't see any port field in Compiler Options; I see only the one in Preferences -> Compiler and that one is set to 9080. You could load your SB file into Notepad and view the hidden data to see if it references a different port.